Italy isn’t a country I’d have planned a bash to on it’s own, it all seems to be a bit hard for my liking, lack of gen, reservations for every IC train, to name but a few reasons; as part of a normal trip though I tried to arm myself with as much info as possible to at least give me a fighting chance with the cranking. 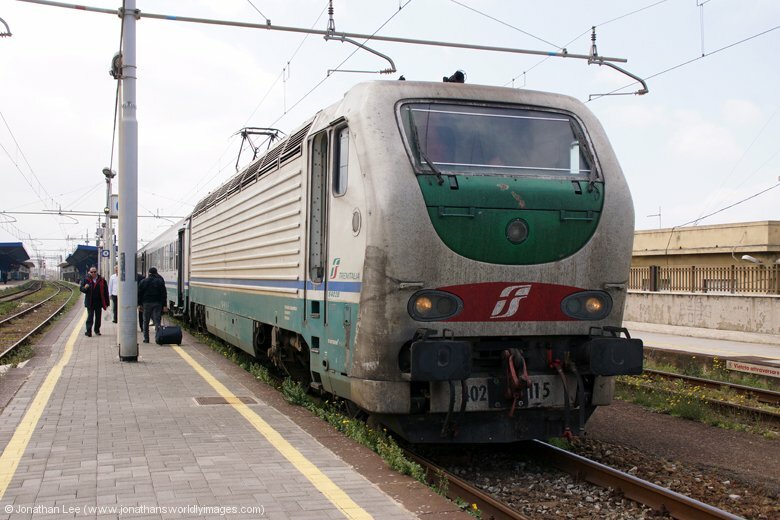 I had been eyeing up Sicily for a while and the fact that the trains from Sicily to the mainland were shunted onto a boat to get there appealed to me. That coupled with the fact we would get to see Mount Etna made Sicily our first calling point and from there we’d head to Pompeii and spend time visiting the Pompeii ruins along with Herculaneum with the monster that is Mount Vesuvius in view virtually the whole time. Personally I was hoping that either, or both, volcanoes would at least be giving off a bit of something from their craters during our visit; what could possibly go wrong? 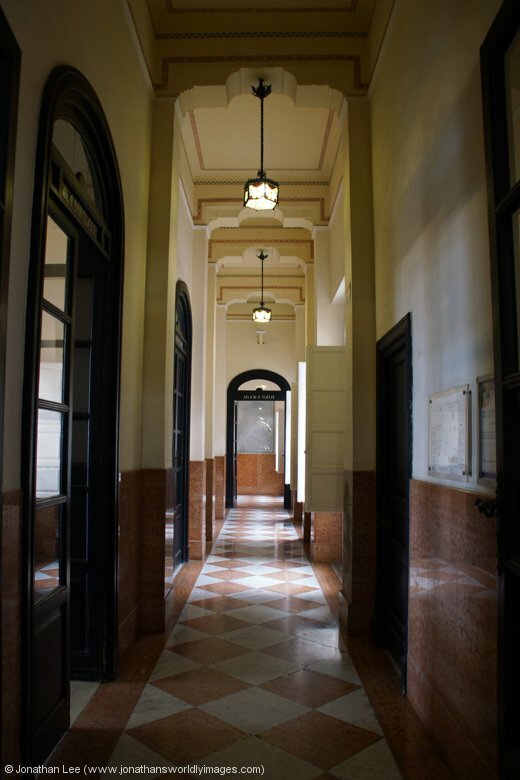 Palermo – Hotel Del Centro (£69 for a double room) – The Del Centro shares the building that houses it with other hotels and businesses; the Del Centro being on the 2nd floor. It’s an old building with a grand entrance and the rooms have double doors that are at least 10ft tall at their entrance. The high ceiling gives a feeling of what the building once was. Despite the olde-worlde style there is air-con, heating a balcony with double glazed windows and the bathroom is well equipped even if you have to chew on the sink while “trying” to utilize the toilet! The biggest problem we had was the noise. It comes from all directions, the road outside, people talking in the corridor, people in adjacent rooms and the noise from bathrooms is very loud. I guess it’s just one of those things with older style buildings. Still, the breakfast was plentiful, bed comfy and the staff friendly and all spoke English. Catania – Katane Palace Hotel (£74 for a double room) – 15 minutes at a steady pace from Catania Centrale and is signposted quite well off the main Via Francesco Crispi anyway. Outside the hotel looks like any other but inside it really does look the part with a grand reception and restaurant, all surrounding a central courtyard. The room was sizeable and very well presented with old style wooden furniture and a massive bed. The bathroom was spotless and had its own toiletries. The contents of the mini-bar were free with the room, there was only a can of Coke, can of Fanta and a bottle of water in it mind. All the hotel staff spoke good English. Breakfast had an excellent choice and plenty of it! Pompeii – Hotel Diana (£142 for two nights in a double room) – 50m from the Pompeii Tren Italia station entrance, over the road and first left. The staff at reception spoke fluent English and we were checked in within a minute or so. The room was on the second floor, while it wasn’t the largest it had enough space for us, with a decent sized bathroom. The TV unfortunately had nothing but Italian channels, the air-con was never used but the free WiFi had a very good signal in our room. Breakfast was good and the buffet always kept topped up by the staff. Rome – La Villetta Suite, Casabianca (£124 for a double room) – a 5 minute walk from Casabianca station and only about 1.5 miles from Ciampino airport. Unfortunately the flight path for planes is right above the hotel, although there wasn’t really much disturbance, the last plane I heard was about 2200 and the first at about 0500 but they’re infrequent in the morning. The hotel room made up for the “limited” noise though, it was very well presented, with a large bed, contemporary decorating and Jacuzzi bath. It even had a Sky box for the 40 inch TV on the wall. The guy at reception was very friendly and gave us a map with all the local amenities as well as booking us a taxi to get us to the airport the following morning. While the hotel does have a policy of letting them know about arrivals after 2000, the front desk is actually manned to 2230 and the entry gate to the courtyard is locked after this time only. Breakfast wasn’t as grand as everywhere else we’d stayed but the food quality was better, certainly with regard to cakes. Advance tickets Doncaster – Peterborough & Stansted – Doncaster and a single from Peterborough to Stansted; which was cheaper than the advance option! 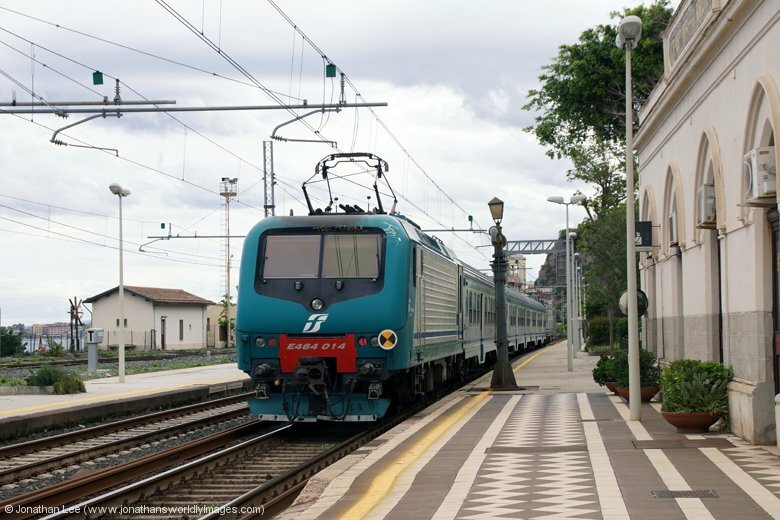 All intercity trains in Italy require a compulsory reservation and these were done prior to travel on the FS website; although not quite as straightforward as it might seem…..
All are 3 Euros per reservation. Having done the usual flight searches right at the start of planning the trip it turned out way cheaper to fly to Palermo from Stansted, with Ryanair, than it would have done flying to anywhere else, with anyone else. The unfortunate result of flying from Stansted, is not only the hassle of getting there, but the 0623 start from Doncaster, followed by the hour fester at Peterborough as the connections from the north onto the Cambridge line trains are generally crap. Still it was our own choice, or more like my doing, and our 0545 taxi eased out of our dreary estate, almost 10 minutes late, through the morning rain, without another soul being in sight. As it was the first work day after the Easter Bank holiday our 0623 train to Peterborough was full and standing by the time we got off. Thankfully the 0818 Cross Country service from Peterborough to Stansted Airport was a little more comfortable. From arriving at Stansted Airport to getting through security only took 15 minutes, the queuing at security only taking 5 minutes. The woman ushering everyone through was clearly used to people not being prepared to take out what they needed to and having their toiletries in the incorrect type of bag; unfortunately the way she came across was quite rude and it was as though she was barking out orders. Bizarrely when we got to put our stuff in a tray she seemed very content that we had all our stuff our and toiletries in the correct type of bag and even asked if we’d “done this before”? If she was insinuating that we were prepared and most others weren’t I was amazed as surely most others in the queue had flown with hand luggage before? Still even I could see size rules being broken all over the place; the consequence of which became very apparent when we boarded our plane! Wetherspoons air-side wasn’t busy and served up a decent breakfast in less than 10 minutes. It was the screens in the pub where we first noticed that our flight was late. The booked departure was 1145, it was showing as expected to depart at 1220. Our plane was given gate 47 to depart from and we were among the first half a dozen people to arrive at it, the plane not having landed at that point, so we chose some seats appropriately adjacent to the boarding gates. By the time boarding had started the queue was a good 60m long and almost to the next departure gate; we just blended in at the front and then stood in the tunnel that leads down to the runway for 5 minutes while the plane was prepared. When we boarded, at the front door, the overhead bins were already beginning to fill up and there was just enough room for ours above our seats. By the time the plane had filled the bins were wedged solid, so much so that the cabin crew began using empty seats to store people’s cases and in some cases had to take the seats off to get them under the seats in front! What they hadn’t bargained for was a family of three turning up almost last and wanting to sit in the very seats that had just been occupied by luggage. Not only did they have this fiasco to contend with but they also had to deal with oversized suitcases that were preventing the bins from being closed for takeoff. All I could really think to myself at the time was welcome to Ryanair and this is exactly what your pay for; the big question I have being is this fiasco the airline’s fault for letting it happen or the passenger’s faults for trying to get away with as much as possible? Either way the general experience I got was one of mild chaos when boarding but once in the air everything was civilized, calm and the service was ok.
Having departed Stansted 45 late we were told on board that we’d be arriving into Palermo in 25 minutes time, which was at 1540 local time. Then at 1600 we were told we’d arrive into Palermo in 15 minutes and we actually landed at 1620! Buses took us from plane to terminal and the walk through the terminal building was straight forward, the passport check being a nothing affair. Unfortunately due to our late arrival we’d missed the 1620 train to Palermo Central, the next one being 1720, as sod’s law would have it 1700 was the only hour of the day where there wasn’t a train to Palermo! The entrance to the station is to the right, outside the airport exit doors. Tickets are purchased from some guy in an office as both self-service machines were out of order. Single tickets from Punta Raisi, as the airport station is called, to Palermo Central cost €5.80 each. We bought these as our Inter Rail passes didn’t start until the following day and this journey would be the only one we’d make on this day. 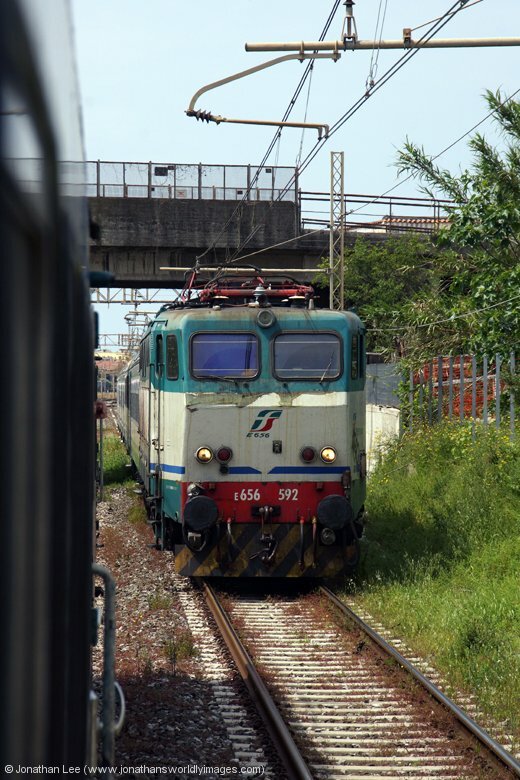 All trains to Punta Raisi are new EMU’s and ours was no exception. It wasn’t wedged from the airport but was well used along the line; filling up the closer it got to Palermo. 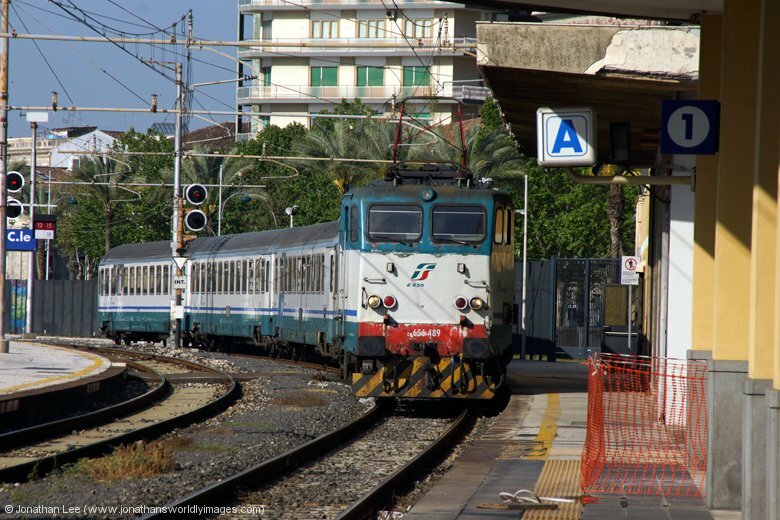 The journey is booked to take 1h07m and although we were a little late at a few stops we were into Palermo Central on time at 1827, just in time to watch E656424 depart with ICN1954 1830 Palermo – Messina. 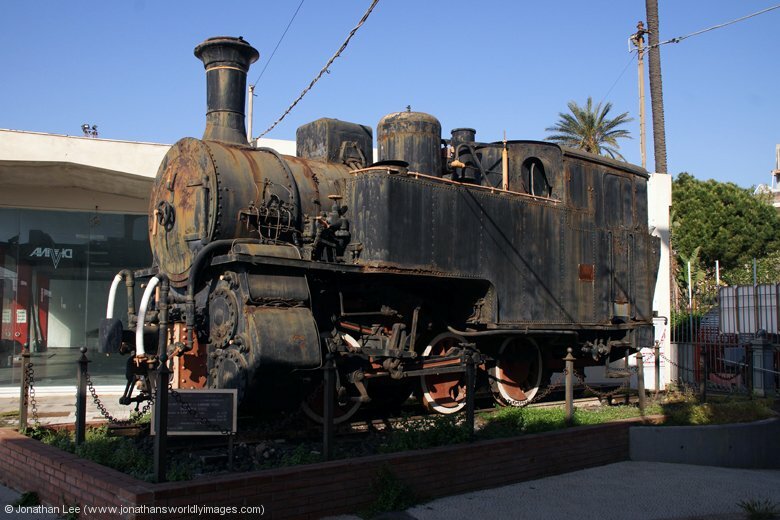 This then joins the Syracuse portion at Messina to go forward to Rome. 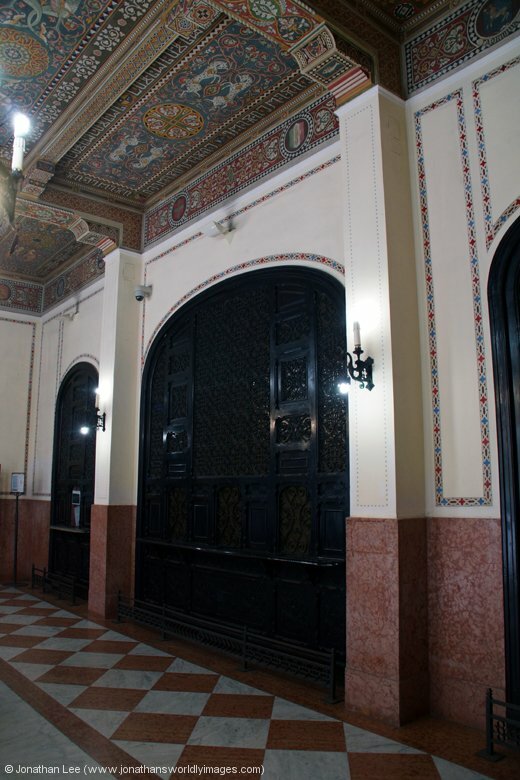 Our hotel, the Hotel Del Centro, was only a 5 minute walk from Palermo Central station, up Via Roma right opposite the station entrance. The Del Centro shares the building that houses it with other hotels and businesses; the Del Centro being on the 2nd floor. It’s an old building with a grand entrance and the rooms have double doors that are at least 10ft tall at their entrance. The high ceiling gives a feeling of what the building once was. Despite the olde-worlde style there is air-con, heating a balcony with double glazed windows and the bathroom is well equipped even if you have to chew on the sink while “trying” to utilize the toilet! The woman at the front desk spoke fluent English and check-in took the time it took her to hand the key over and direct us to the room. We’d seen nothing in the way of food places between the station and hotel, other than McDonalds on the station concourse but the woman at the hotel desk soon pointed us in the right direction when she marked two pizzeria’s on the handy Palermo map she’d also given us. We didn’t walk far and after having a quick scan round the Piazza Pretoria, which did give us incentive to return the following morning, we chose to eat at Il Proverbio. This place being tucked away down Via Discesa; a few minutes further up Via Roma on the left. It was situated on a street that had lots of baby shops on it and randomly the only other shop was one selling coffins! They were full sized I might add. The Il Proverbio was empty when we arrived just after 1900. The service was good and the food was great; the bill was even greater. The whole meal, two bowls of pasta and two pizzas, including drinks, only came to €33 and that was with a €4.50 service charge included. I’d been too used to bills coming in Switzerland and this cheapness made a refreshing change. We had to buzz in at the very grand 15ft by 5ft wooden double doors that sealed the hotel entrance at night but it only took a moment for us to be allowed access. Having had a very early start that morning we were in bed before 10pm, only to be kept awake by the noise the family in the next room were making, the noise of flushing toilets on the floor above and then the noise that 4 women were making right outside our room door as they sat having a conversation on the sofa that was situated there. Thankfully they moved on straight away when I asked; whether it was because they understood or were scared off by the fact I was stood at the door in my boxers my opening the door had the desired outcome and sleep soon followed. Breakfast was well laid out in the “cozy” breakfast room, which had tables for two that could barely fit two plates on. Which was bizarre as the selection of cakes, croissants, cereal, bread and yogurts to choose from was excellent. Our drinks had to take up a table of their own in the end! 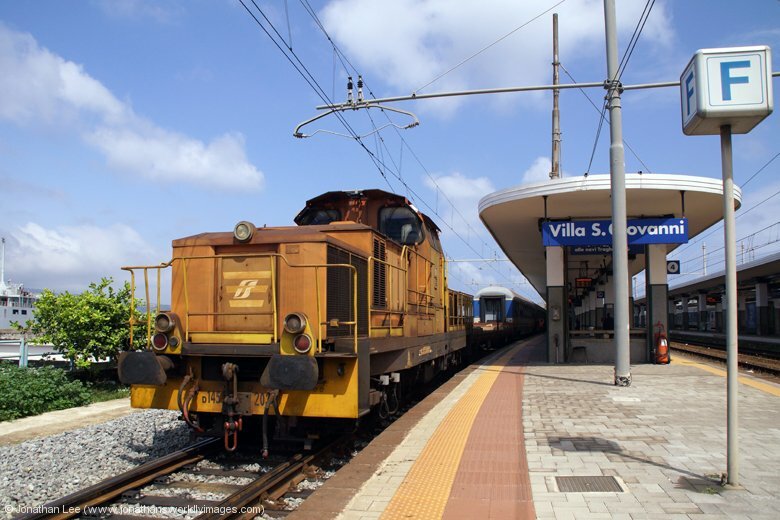 As we had a 1005 train to catch our time was very limited in Palermo and we had to check out and get to the station. Checking out was as simple as checking in; everything being charged to the card I’d made the booking with and a receipt quickly being printed. Bidding farewell to the Hotel Del Centro we were waiting patiently, on the pleasant station that is Palermo Central, for our train to back in by 0930. There wasn’t much else about and E656096 backed our four coach set into platform 4 at 0935. Coaches were numbered and we found our compartment seats in no time. The train wasn’t full from Palermo but filled up en-route to Messina but there wasn’t any hassle with the seat reservations and the ticket inspector was more interested in this than he was in either of our Inter Rail passes. Thankfully I’d booked our reservations on the TrenItalia website before flying out, each costing €3. It took a bit of figuring out how to do just the reservation only and it was a few steps into the process before it did become even mildly apparent. The weather was indifferent for the run to Messina and it rained on and off which always spoils a run down the coast, making it look more miserable than it really is. Unfortunately low cloud prevented any sort of view inland. The outlook turned a bit bleak at Messina when we arrived to find an EMU on the 1320 Messina – Catania. Despite our initial bowl out things did improve and we had time to figure out what to do while watching the mass shunting of trains to/from boats and the associated engine changes that went with them. 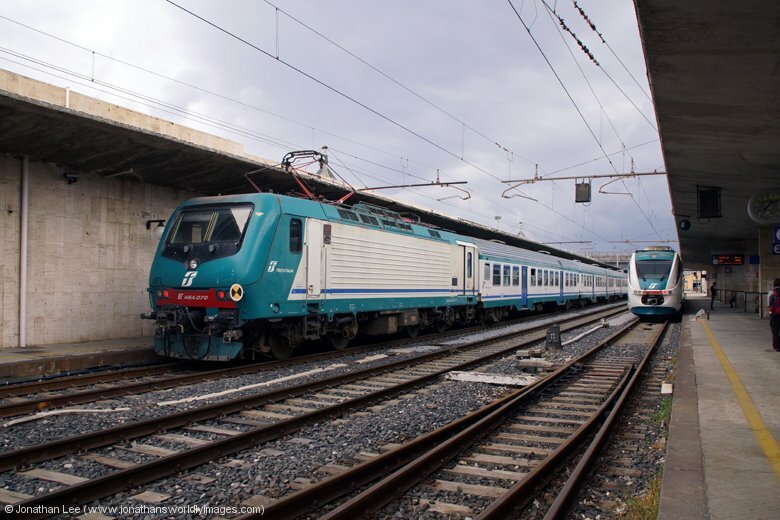 There were two 145’s doing the shunt moves, both in use at the same time; 1452027, which brought ICN785 Rome – Syracuse off the boat for 656489 to work forward to Syracuse, and 1452039 which took IC730 Palermo – Rome onto the boat after 656497 had arrived from Syracuse with IC724 1025 Syracuse – Messina to connect with the Palermo portion. 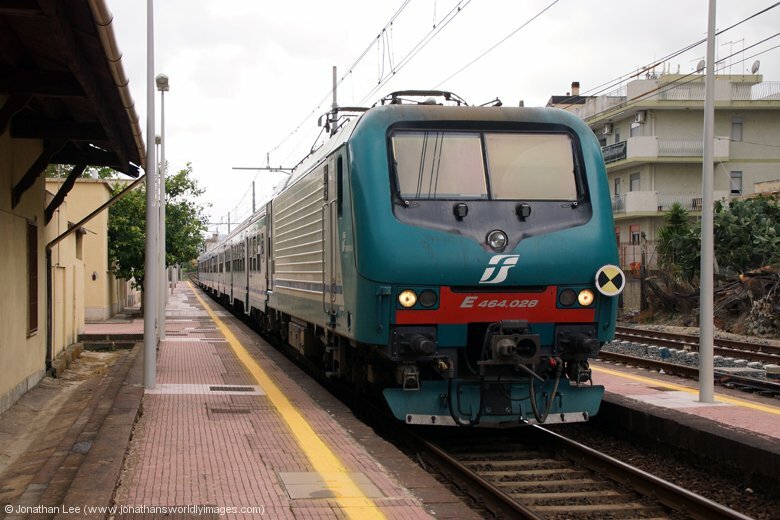 I’d done a simplifier from E656.net for relevant trains at Messina, Palermo & Catania to make sure we were on hauled trains and not EMU’s; which didn’t seem to be worth the time it’d taken me to do it at that point. Strangely enough I read a report on ERG when we got to Catania where others had suffered the same fate on the Palermo line; albeit with greater consequences than we’d endure. As what we’d taken from breakfast at the Hotel Del Centro hadn’t really filled a hole I managed to get some pizza & pop from a place on the station concourse at Messina. 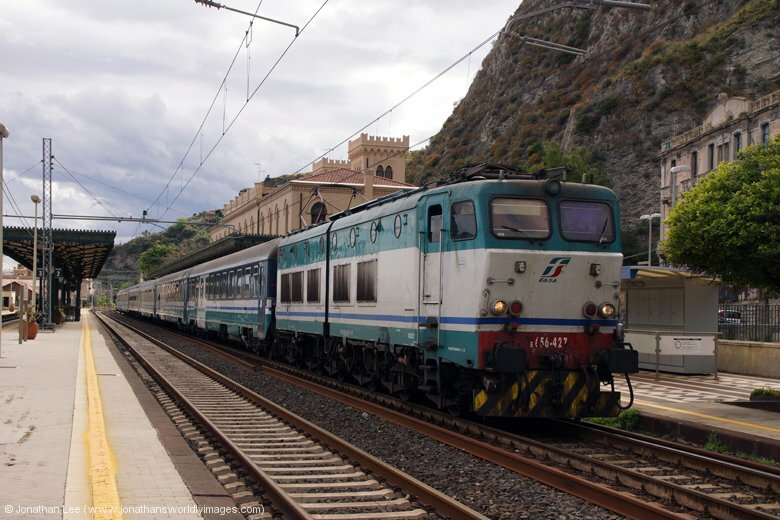 Thankfully the 1335 Messina – Palermo was a 464 and sat in platform 1 before the 1320 departed. 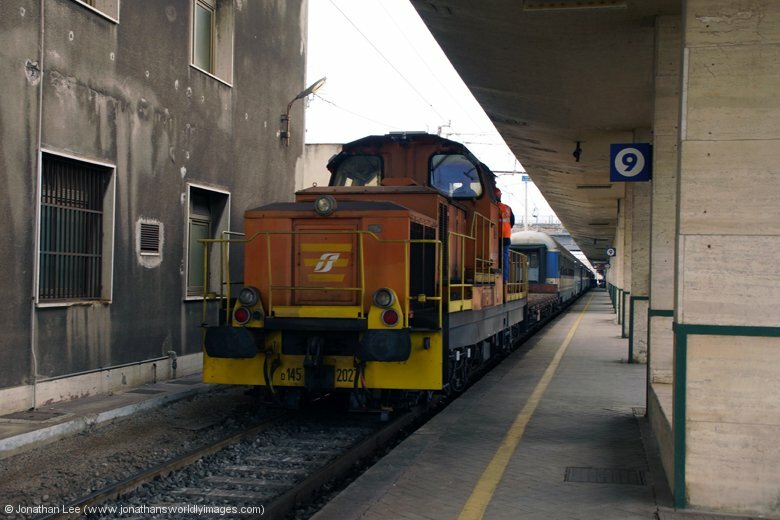 By the time we departed an EMU was already sat in platform 3 to form the next train to Catania at 1410; which was also supposed to be a 464 according to E656.net. Now not trusting the gen I had in front of me at all I was very skeptical about getting off and doing any move at all and had all but settled on going to Taormina and festering there for IC721 forward to Catania; until we were dealt a bonus by TrenItalia when we were into Santa Teresa Di Riva before the northbound train that it was booked to cross. With plenty of warning I spotted the 464 coming the other way and we had plenty of time to get our bags and scramble across the tracks before it was anywhere near the platform ends. 464028, with the 1302 Catania – Messina, deposited us at Ali Terme a couple of minutes early so I took the opportunity to get a photo before the train departed. When I was walking back down the platform the guard was saying something to me in Italian, which of course I couldn’t understand and gestured such with a shrug of the shoulders. The next thing I know he’s saying “boom” to me and gesturing with his arms up in the air and then saying the word terrorist. From which I could only assume that he believed that my taking photographs of trains would result in his train being blown up and of course by preventing me from doing so would prevent worldwide terrorism; well I had news for him, which unfortunately I didn’t get time to explain as his train had to depart! The sun was attempting to come out during the afternoon but unfortunately the sea breeze was keeping the temperature down and of course messing my hair up! 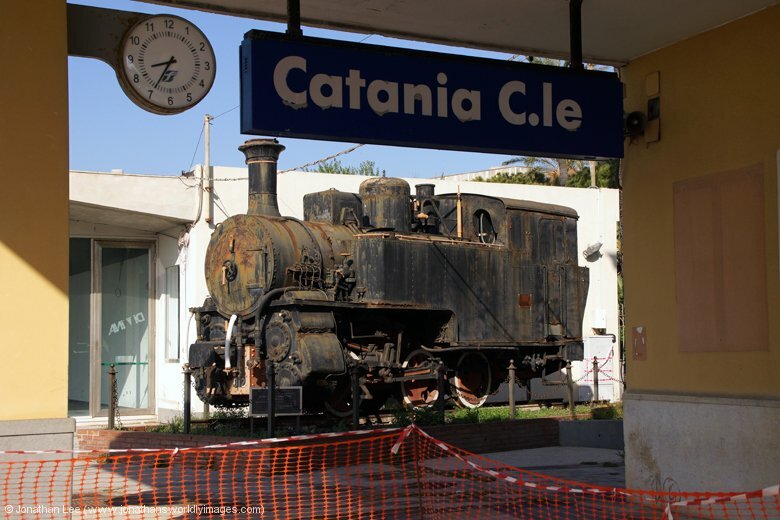 Not knowing whether we’d be bowled out or not as the announcement came for the 1432 Messina – Catania came I eagerly awaited it’s arrival on the platform edge; while the whole time, for 10 minutes, the dinging of a bell went off to warn people of the train’s arrival. Pleasantly surprised I was when a 464 came into sight and even more so when the one on the rear, with pan up, came into view; 464612 with 464014 powering on the rear. The 1432 Messina – Catania was the last train south before IC721 so we got off at Taormina anyway to wait for it and hour behind. I had grand plans of nipping up the hill from the station to get the view down the coast to Catania and Mount Etna but I’d severely underestimated the distance from station to hilltop and as it happened we discovered Mount Etna to be shrouded in cloud anyway! So a fester on the station it was. Taormina seemed to be a bit sleepy for a tourist destination but it did look very pleasant on the run in on the train. The sleepier the better for me anyway. Having not been able to use any form of toilet since Messina we were so pleased to find one on the platform at Taormina; unfortunately we had to pay 50c to use it. Bizarrely you had to change your money into 50c denominations, in the machine provided, first. Then it took some figuring out that you put the same 50c pieces back into the machine for it then to spit out a token which was then put in the slot to gain access though the electronic sliding door; which looked more suited to a high-tech medical facility which housed diseases that you didn’t want let out into the open! It was very bizarre indeed and very out of place for Taormina station looked about as original as they come. The station fittings on the platform were old, the booking office looked original, with all wooden paneling around each ticket window, even the station sign on the outside of the building looked to be set in original tiling. It was a very pleasant place to wait at and the 30 minute late arrival of IC724 from Syracuse, headed by 656427, broke the hour up nicely. My attempts to get a reservation from the ticket machine failed miserably, three times. While quite easy to do the first machine told me to put money where it didn’t have a slot and the second machine told me there was a transaction error twice; having had two different €10 notes. So on we got without a reservation when IC721 arrived, slightly late. We never even saw a guard all the way to Catania and had a compartment all to ourselves, in the front coach right behind 656497. Arrival into Catania was only a few minutes late. From the station we had about a mile walk to the Katane Palace Hotel, which we found easily with a small map in hand; the walk taking about 15 minutes at a steady pace and is signposted quite well off the main Via Francesco Crispi anyway. Outside the hotel looks like any other but inside it really does look the part with a grand reception and restaurant, all surrounding a central courtyard. Check-in was simple and only took a minute, both the woman on reception and the guy showing us to our room speaking good English. The room was sizeable and very well presented with old style wooden furniture and a massive bed. The bathroom was spotless and had its own toiletries. The contents of the mini-bar were free with the room, there was only a can of coke, can of Fanta and a bottle of water in it mind. All in all a good choice and for the price I’d paid very good. My 2006 Lonely Planet had showed the Katane Palace to be the only top end place in Catania at the time and the rooms then were apparently €250 plus per night so I was very happy with my £74. The hotel’s restaurant didn’t open until 8pm so we asked at reception and were pointed in the right direction of the decent eateries in Catania, all of which seemed to be on one street; Via San Filomena, off Via Umberto. Our plans of eating early were soon dashed when the Restaurant Il Sale staff told us they didn’t open until 8pm. Reservation made we ended up having desert first at a Gelateria before trying to walk it off afterwards while attempting to spot Mount Etna from Giardino Bellini, off Via Etnea. Despite the weather brightening up and the sun having been out Etna was still under a shroud of cloud so we had to make do with a glimpse of it through a break in the clouds. Food at the Il Sale turned out to be great, we only had pizza but they were massive; a meal in their own right. By the time we left people were queuing out of the door to get tables at the place and all were locals too; other restaurants on the street were also full but none seemed to have the amount of people waiting as were waiting at the Il Sale. Walking back through the almost deserted streets of Catania gave a lot more perspective to the place than when they’d been busy with people earlier. The narrow roads weren’t gridlocked anymore either and the old buildings fitted into the place a bit better at night, once the shops had closed and shutters been put down, hiding away the shops behind them; this was more what I expected of Sicily, it not to be trying to be like Milan. Thankfully the car alarm that had been going off across the street before we went to bed didn’t go off again once we’d retired for the night; something else would wake us the following morning instead! We were treated to a very rude awakening at 0545 in the morning when a very loud alarm went off in the next room, followed by some very loud taking among themselves and then some very jovial talking with what sounded like a mobile phone on loudspeaker! After 5 minutes of laughing and giggling I reluctantly got out of bed and went to knock on their door. The noise they were making was clearer in the corridor so I was convinced that there were more people awake thanks to their complete lack of regard for anyone else in the hotel. Immediately after my knock a voice from the room, with an Australian accent, asked “who is it” to which they got both barrels about the fact most other people were still trying to sleep. Immediately the phone call to the other side of the world was terminated and there wasn’t another peep from them that morning; not until a family sat next to our table at breakfast, all speaking with Australian accents. From listening to them over breakfast it was one of the group’s birthday, which was probably what the phone conversation was all about. Still, it could have been made at a reasonable time and not stupid o’clock; ignorant bastards! Breakfast at the Katane Palace was plentiful with a very wide selection of cakes more than anything else! There was plenty to go round though and a relevant pack-up was stashed away for our 8 hour train journey to Pompeii. We walked the 10 minutes back down to the station that morning and having noticed the crystal clear skies we managed to get our first real glimpse of Mount Etna as it towered above Catania in the distance. Our best view being from the front of the station itself. Waiting to depart as we arrived at Catania Central was 656096 with ICN1955 Rome – Syracuse; waiting time, which was bonus for those on board to be on time! 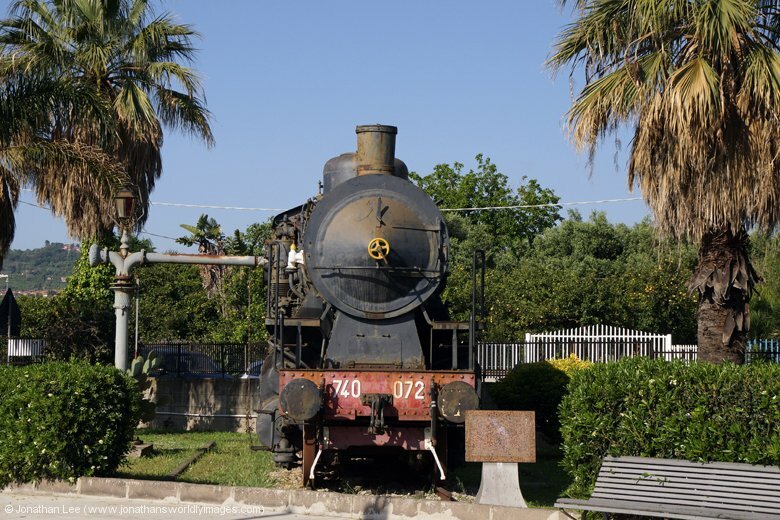 Our IC722 Syracuse – Messina was showing on time and promptly arrived, in full sunshine, with 656489. As we sat in our reserved seats it appeared that there seemed to be some sort of reservation scenario going on as some guy kept bringing more and more suitcases into our compartment; where all 6 seats were already taken! It turned out that he had 6 seats reserved for his family but the auto-reservation system had split them between two compartments. 2 minutes later we were sat in a different compartment with two quiet teenage girls who hardly lifted their heads the whole journey; meanwhile back in our old compartment, at the opposite end of the coach, the noise from the children within could be heard coach-wide! Well avoided there……..
As it was such a clear day the run to Messina was very nice, with cracking views of Mount Etna. The run down the coast at Taormina was also very picturesque. 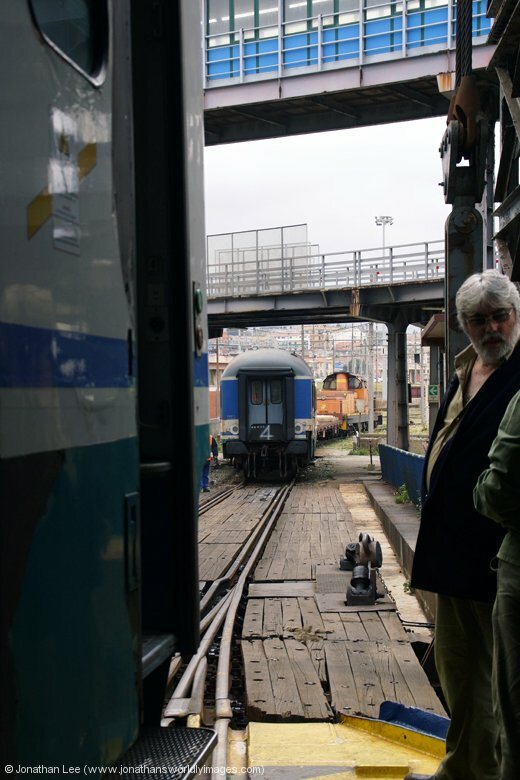 We rolled into Messina a few minutes late, at which point I couldn’t figure out whether to try and get a list of the demic 656’s etc on the shed, or try and get the number of the 145 shunter that would shunt us onto the boat, just in case there wasn’t another chance! I failed miserably at the former, mainly because most of the locos only have numbers on the front ends, so I concentrated on the latter. 1452027 was sat in the yard without a driver but 1452039 was sat in the adjacent platform as we rolled in, already coupled to the stock off the Palermo portion; which it shunted out immediately after we’d stopped and backed the Palermo set onto the rear of the Syracuse set. A bonus rod move there if you hadn’t planned on going forward to the mainland. Our 1115 departure time had passed before we were eventually propelled out of Messina Central towards our waiting ferry. The 145’s have a flat wagon and a coach in their formation and it soon became clear why. The ramp up to the boat is quite steep and the barrier vehicles both prevent the 145 having to access the ramp or try and push up it. 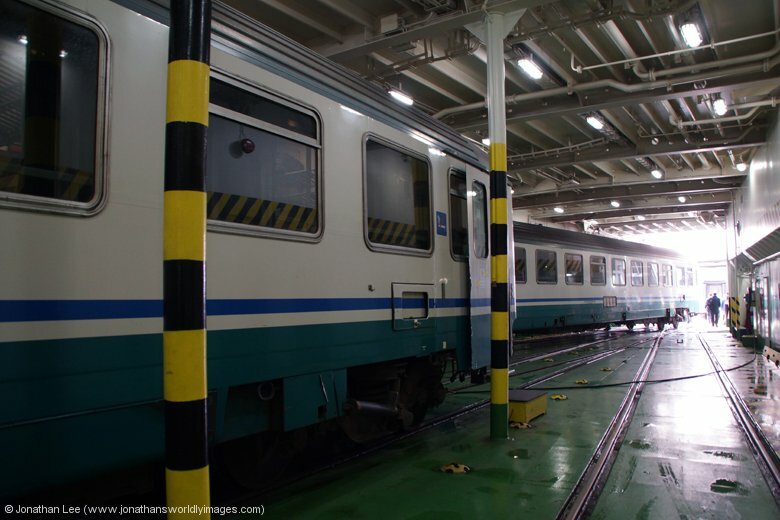 The load 9 set was too long for the ferry in one go and it had to be split in the middle with both Syracuse & Palermo portions effectively being on the boat separated. Within seconds of the 145 having moved clear the ramp was moved clear, the ferry doors closed and departure proceedings underway. From the moment the train is on the ferry the doors are opened to allow people to wander round freely. The stock is connected to a shore supply to allow the air-con to keep running; which was good as it was quite warm below decks. Above decks though it was quite breezy but sunny at the same time. Our ferry was called Scilla, evident from the life rafts on board and the captain had us underway within minutes of us getting onto the deck, of what was a relatively empty ferry. 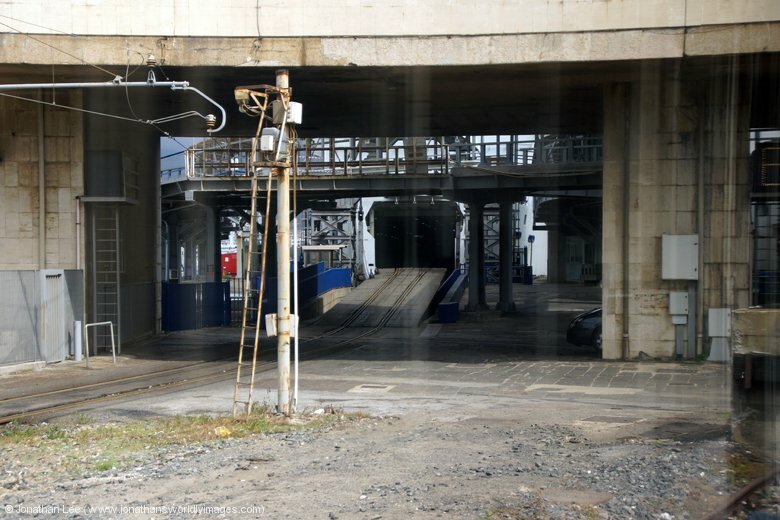 There were no cars on board and very few people in general, so maybe the ferry was solely for the train? The journey took about 25 minutes, the views of the mainland, and Sicily that we’d left behind, were excellent. The ferry had plenty of room to sit inside and somewhere to buy refreshments. En-route the ferry turns so the stock is shunted off the ferry from the same entrance it is shunted on. Try as I might to get the number of the 145 as it collected the Palermo portion first, I failed. I had to wait until we’d shunted into Villa San Giovani station and leg it up to the end of the platform before it shunted off, then walk the whole length of the train to spot 402115 which had backed onto the other end by the time I had. By FS standards our run seemed to be a good one, until the outskirts of Salerno, as we were waiting time at most places until we sat somewhere for 10 minutes; which strangely only resulted in us being a couple of minutes late into Salerno; where we ended up getting off, as opposed to Napoli Centrale, where we were reserved to. 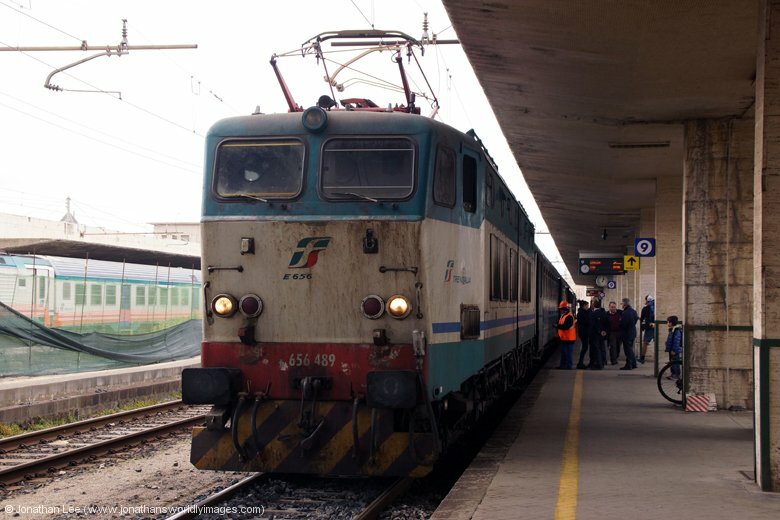 Bizarrely, and I’m thankful I did, I had decided to check some train times for Pompeii and randomly came across the fact that there were no Tren Italia trains running between Napoli & Pompeii and trains only running from Salerno to Torre A. Centrale, the stop after Pompeii, in the opposite direction. 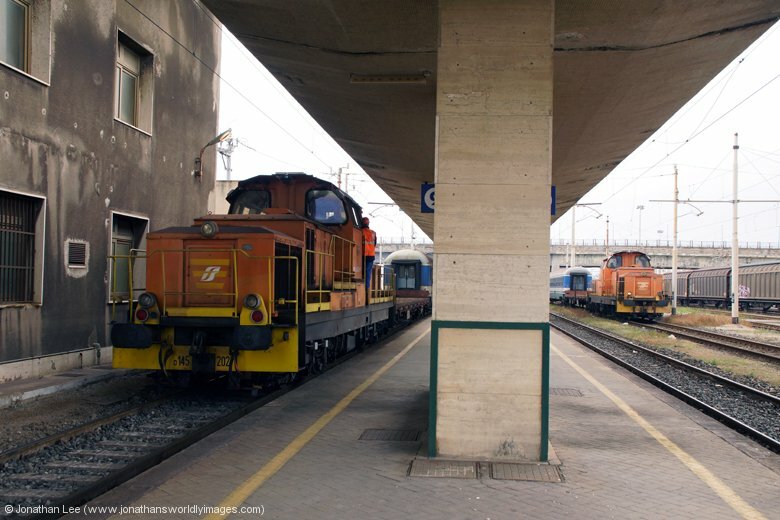 This meant two things, one, all my pre-worked moves on 464’s on the Napoli – Pompeii – Salerno line were in the bin, and two, we had no real choice but to get off IC728 at Salerno for a train forward to Pompeii. The EU Rail app was spot on with the gen though and when we got to our hotel the staff told us that a wall had collapsed on the railway in February and repairs hadn’t been completed yet. With the lack of service on the Pompeii line I was half expecting, but secretly hoping not, that everything would be unit on the line. 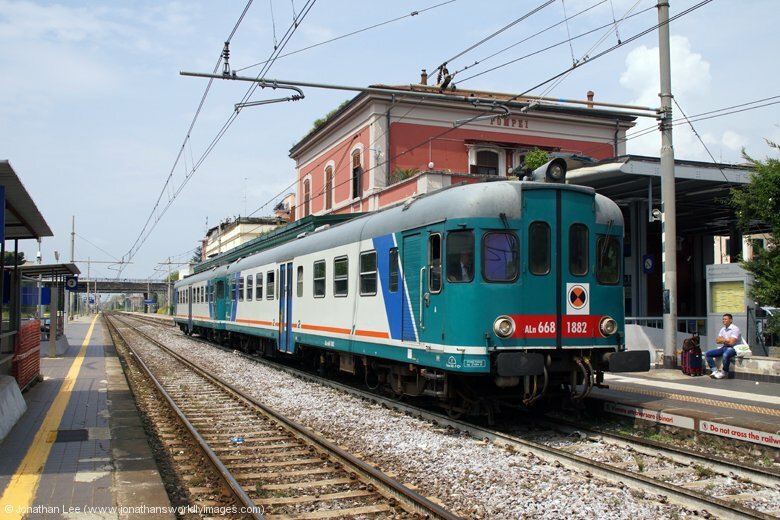 The 1540 Nocera Inferiore was a new EMU yet the 1600 to Torre A. Central was a pair of 668 DMU cars, 1845/1868, on an electrified line! Bless the little DMU, it could barely pull itself up the hill towards Cava Dei Tirreni and had lost 10 minutes in the process of trying; it was shocking and yet made more noise than plenty of loco’s I’d had in the recent past, including 218s! Still it was a DMU, and a complete bag of spanners at that. I was more interested in the view over the bay as we climbed away from Salerno than it and was feeling slightly aggrieved that I had to suffer inferior traction on a line that it clearly wasn’t capable of keeping time on. The only good thing about the whole journey was the opening windows. We found our Hotel Diana 50m from the station entrance, over the road and first left, exactly where my map said it would be. The staff at reception spoke fluent English and we were checked in within a minute or so. The room was on the second floor, while it wasn’t the largest it had enough space for us, with a decent sized bathroom. The TV unfortunately had nothing but Italian channels, the air-con was never used but the free WiFi had a very good signal in our room. With plenty of time to kill we chose to wander around town for a bit and familiarise ourselves with our surroundings. The staff on the front desk gave us a map and showed us where the pertinent landmarks were, including the nearest entrance to Pompeii’s ruins, along with marking on the best places to eat in town, two of which were right by the hotel, the other, and the place we ate at every night, the Margherita Pizzeria was right outside Pompeii Circumvesuviana station. Having tried the Margherita Pizzeria straight away, only to find it closed until 1930, we then walked the short distance up to the entrance to Pompeii ruins, which is not the one all the guide books direct you to. This entrance is only a 5 minute walk from either Pompeii Circumvesuviana (not Pompeii Scavi) or Pompeii Tren Italia stations and is on the road which leads away from the front of Pompeii Cathedral (for full details see following morning’s trip to Pompeii ruins). Pompeii is a pleasant town and unlike Palermo and Catania it is not built up with a 1970’s feel to it, it is actually more like a town you’d want to spend some time in and relax a little; very open and un-city like. Everything along the road to Pompeii ruins is geared up to the tourist, selling the usual souvenirs and tat, along with there even being a McDonalds. Everything around the main square, where the Cathedral is, is mainly about food with every other shop seemingly being a Gelateria. By the time we made our way back to the Margherita Pizzeria we were more than ready for our food. It was a simple place, which had a bit of a pub feel about it, with a simple menu; pizzas and a few side dishes, no pasta at all. Our food was delivered to our table within 5 minutes of ordering and was very good. The only complaint I could have was that with the door open all the time the pizza went cold by the time we left. Locals were queuing and waiting for tables by the time we left though so it must be a restaurant worth the wait; especially as we saw at least two on the way back to the hotel that were completely empty! Having had a long day travelling it was good to sit and relax in the hotel, knowing we didn’t have to pack for departure the following morning. We were up for an early breakfast at the Hotel Diana and a good one it was, with a good selection to choose from. Of course a pack-up was duly made. As we headed out to catch the 0846 Cirumvensuviana train to Ercolano Scavi, for the Herculaneum ruins, we decided that as the weather was so great we would do Pompeii ruins instead and make a bid for Herculaneum in the afternoon. 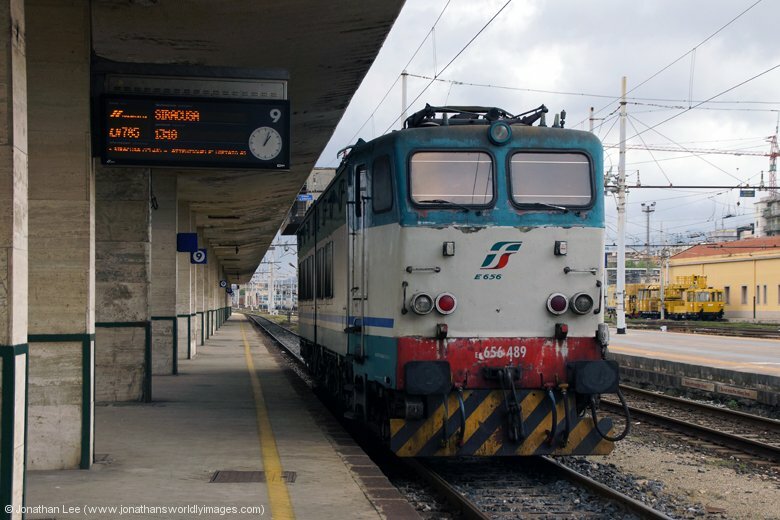 Little did we realise at the time that it was Liberation Day in Italy and a bank holiday so the 0846 train to Ercolano Scavi wouldn’t run anyway! The entrance to Pompeii ruins nearest town is just along the road from the Cathedral and is a 5 minute walk from Circumvesuviana’s Pompeii station on their Poggiomarino line, this is a completely different entrance to the one the guide books direct you to, which is accessed from the Circumvesuviana Pompeii Scavi station on the Sorrento line. The town entrance is also equidistant from Tren Italia’s Pompeii station on the Napoli – Salerno line as it is from the Circumvesuviana station. Having visited Pompeii ruins in the morning we opted for Herculaneum runins in the afternoon. Our train tickets from Pompeii to Ercolano-Scavi cost €1.70 each and had to be validated in a machine before travelling; from which point they’re valid for 80 minutes. The train journey takes approx 45 minutes and ours wasn’t a full train, despite the amount of people on the platform giving the impression that it might be. Arriving into Ercolano-Scavi there is only one exit from the station and you can only walk one way once you’ve exited. The entrance to Herculaneum is approx 500m straight down the hill towards the coast, and directly in front of you at the bottom. Having finished at Herculaneum we attempted to try and do Mount Vesuvius in the late afternoon but failed miserably due to arriving at the entrance gates a few minutes late! So we ended up back at Ercolano-Scavi earlier than we’d anticipated, to make our way back to Pompeii. The irony of the whole thing being that the 1816 train to Pompeii never turned up and we ended up not getting back to Pompeii until the same time we would have had we actually got inside the crater site! Of course we still hadn’t realised at that point that it was holiday day in Italy, hence the 1816 not turning up, as it wasn’t booked to run! Ultimately we then ended up getting on the wrong train as a Sorrento train turned up at the time of the 1844 to Poggiomarino; which had no working electronic destination blind at the front. 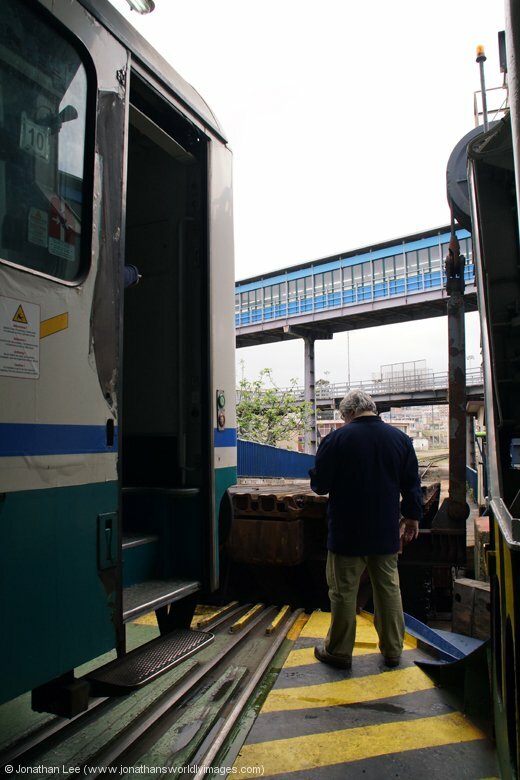 I ended up confirming with the guard, who was in the front cab with the driver, that the train was a Sorrento train and he advised us to get off at Trecase and wait for the Poggiomarino train behind. As we didn’t arrive back into Pompeii until gone 1930 we walked straight out of the station and into the Margherita Pizzeria. As we left about 30 minutes later people were again waiting for tables to become free; a popular place it was. As we walked through town, back to the hotel, we noticed that it was a lot busier than the previous evening. It was when I asked at the hotel that we became aware that it was Liberation Day in Italy. A relatively relaxing morning for my girlfriend’s birthday and after breakfast we had a private trip to Mount Vesuvius; having not quite managed to get to the crater the previous evening. Having picked our bags up from the Hotel Diana we chose not to wait at Pompeii for our train to return from Torre A. Centrale and did it through instead; more so we got a seat to Salerno than anything else. It was the same Aln668 units, 1868/1845, that we’d had to Pompeii two days previous and a further pair went the opposite direction to Nocera just before we departed for Torre. Our first journey of the day would set the tone for every other one we made that day, as we departed Pompeii 8 minutes late. Our return journey from Torre to Salerno departed origin 6 minutes late; even the guard seemed a little confused as to why as there didn’t seem to be a reason as to why the signal hadn’t come off to allow us to depart. The journey down the Amalfi coast as we approached Salerno wasn’t quite as nice as it had been on our way to Pompeii as it was absolutely pounding it down with rain and we couldn’t actually see out of the windows. Arrival into Salerno was 12 late where we found 464223, having just been brought in from the sidings, to form 12435 1354 Salerno – Ponteza Centrale. This departed Salerno 2 minutes late, all due to the fact that the driver disappeared under the underpass 2 minutes before departure time. His antics cost us our plus 2 at Battipaglia as 464095 was just arriving as we were; with 34510 1245 Sapri – Napoli Centrale. We were at the front of the train and the steps were at the back, had we just rushed across the tracks, like Italians seem to do without hesitation, we’d have made it. As it was we missed it and then found IC556 Reggio Calabria – Roma Termini 15 late on the screen. 403006 deposited us back at Salerno on IC556, 20 late. 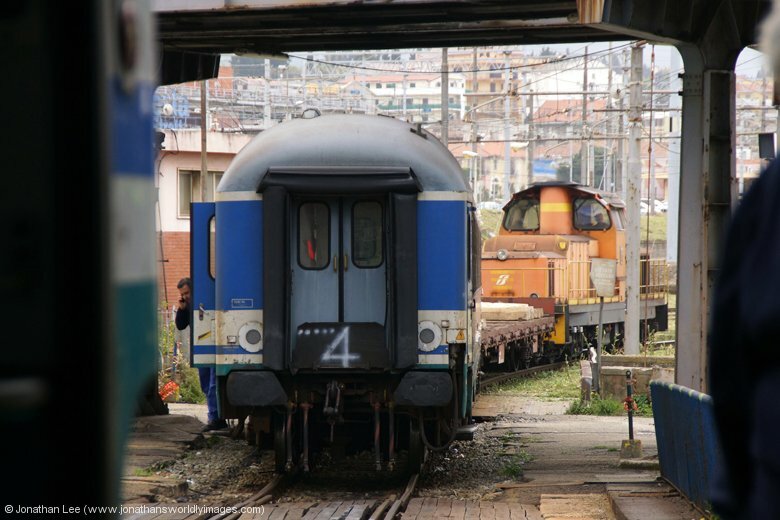 34550 1500 Salerno – Napoli Centrale was already sat in waiting to depart with T&T 464676/220. This was the train we would have been on from Pompeii had trains been running via Pompeii to Napoli but it had been retimed to run non-stop from Salerno to Napoli, arriving at the same time as it would have going via Pompeii. 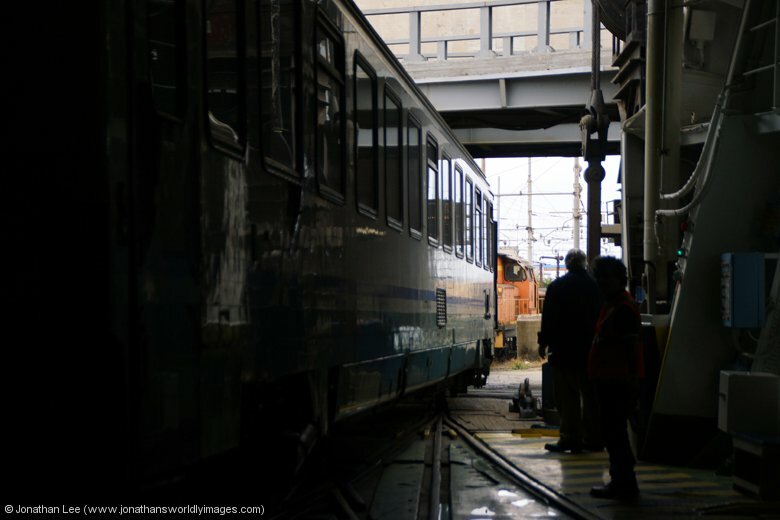 Naples is one of those places where all the guide books tell you to be careful and we could understand why when standing on the concourse of Napoli Centrale; it just had that vibe about it. We immediately saw three teenage lads being escorted off the concourse by the police, one of which thought it was a sensible idea to stick his hand out towards us, I can only assume gesturing for money, but he was wrong and told where to go in no uncertain terms! Having had some food in the food court we stood waiting for our IC728 to Roma Termini to be allocated a platform only to find IC556 just arriving, which confused me a little. 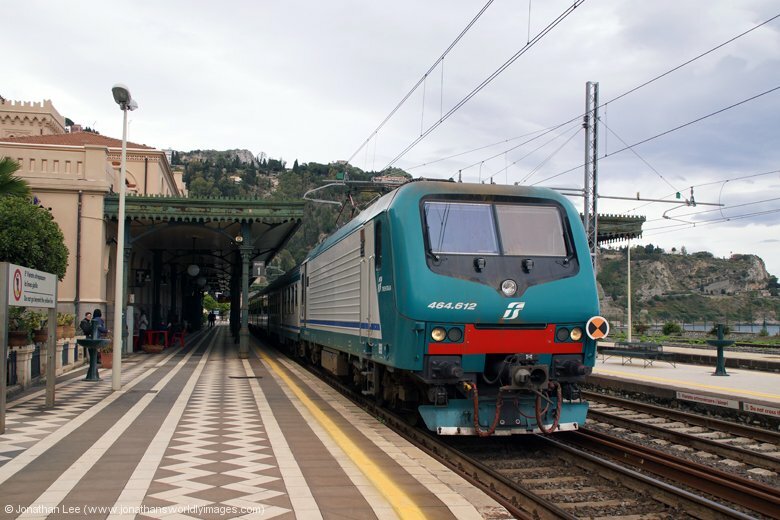 We’d got off this train at Salerno, it had departed while we sat on our Salerno – Napoli train in the adjacent platform and yet we’d arrived into Napoli, had food and still watched it arrive after we had; almost an hour late! Ultimately IC556’s late running was responsible for our late departure on IC728 to Roma as the shunter had been dealing with attaching the engine to IC556 and it then departed across the line of locos outside the station preventing ours from backing down. We left 10 late with 403008. Our 6th train of the day and our 6th late one at that, 3 of which had started late from their origin; it doesn’t paint a good picture for TrenItalia now does it? Noise seemed to be the order of the afternoon as both our compartment, and the whole train for that matter, was full. Some young lass thought it was a good idea to have her large suitcase on the floor in the middle of the compartment, limiting legroom, while one of her travelling companions had hers on the luggage rack but was dripping wet and of course dripping on me; until I moved it. The last person in their group couldn’t sit down due to the suitcase taking up all the room so he stood at the door and had a very loud conversation across us while doing so. The only way out was to put earphones in and drown out as much of the noise as possible; even more so when some infiltrator from another compo decided to get into the empty seat and then they all watched video’s on their mobile phones. The whole 2 hour journey from Napoli to Roma was just rubbish and one I wanted to forget from the moment we stepped off the train. Roma Termini was full of 464’s when we arrived and also full of people! We found out later that people were flooding into Rome to witness two Pope’s being made Saints the following day, hence the busy trains and busy station. This would also give a reason for the high hotel costs when I’d been looking at Rome as a base at the start of the holiday planning. Due to these high prices I’d managed to find a hotel not far from Rome Ciampino airport, which allowed for a step-off move as we headed out to Casabianca, the stop after Ciampino. 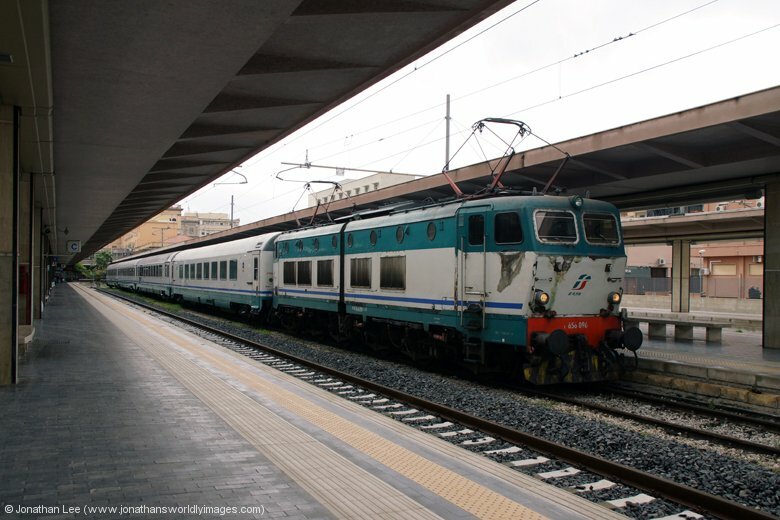 As every train we’d travelled on thus far had been late, to keep the day’s tradition going 464145 departed 7 minutes late from Roma Termini with 21919 1914 Roma Termini – Frosinone. We got off at Ciampino, where the departure screens didn’t work and we had to find a platform departure poster confirming platform 3 for our train forward to Casabianca. This ended up being re-platformed to platform 1 anyway, thankfully I could understand enough of the announcement to figure out it was our train that was being announced; and of course it was also late. 8 trains, all late, 5 late ex origin; this could almost have been Indian Railways! 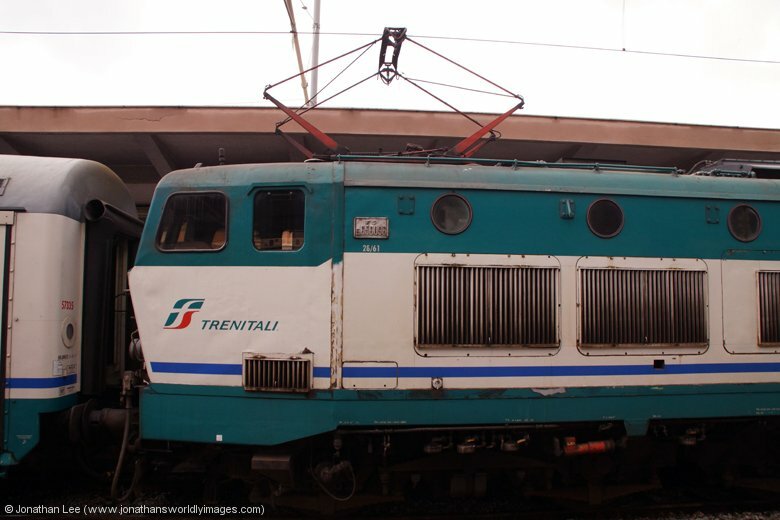 TrenItalia seems to be a bit of a joke compared to other European rail systems. I was quite glad to see the back of it as we watched 464630 depart Casabianca from the road crossing. Of note is the fact that the back of the trains are off the platform at Casabianca. Thankfully the guy at our hotel reception had told us this when I’d rang from Naples to say we might be just after the 2000 arrival limit that the hotel sets. La Villetta Suite is only a 5 minute walk from Casabianca station and only about 1.5 miles from Ciampino airport. Unfortunately the flight path for planes is right above the hotel, although there wasn’t really much disturbance, the last plane I heard was about 2200 and the first at about 0500 but they’re infrequent in the morning. The hotel room made up for the “limited” noise though, it was very well presented, with a large bed, contemporary decorating and Jacuzzi bath. It even had a Sky box for the 40 inch TV on the wall. The guy at reception was very friendly and gave us a map with all the local amenities as well as booking us a taxi to get us to the airport the following morning. While the hotel does have a policy of letting them know about arrivals after 2000, the front desk is actually manned to 2230 and the entry gate to the courtyard is locked after this time only. Food at the nearby Estrogusto Restaurant, which we walked past on our way from the station, was probably the best, and largest, pizza we’d had on the whole trip. We were the only foreigners in the restaurant yet it was full of locals and the food portions being dished out were massive. Bizarrely it was the first menu we’d come across on the whole trip that was in English. As I lay in bed that night, listening to the very loud engines of a departing plane, it seemed like ages since we’d been at Vesuvius that morning and the fact that we’d started the trip in Sicily was almost out of mind. Breakfast at La Villetta Suite was the best we’d had on the trip, most notable was the fact that the cakes weren’t dry like everywhere else we’d been. There was a wide range of things to choose from and the cereals were actually cereals, like Cheerio’s for example, and not rubbish. In true fashion we still made up something to take with us, after all Ryanair weren’t going to feed us. Although in the end they did feed us but for completely different reasons to what you may think! Taxi’s to the airport cost a fixed €15 and the journey takes less than 5 minutes. Getting through security at Rome Ciampino was a breeze and we were sat in the waiting hall within 5 minutes of getting out of the taxi, the screens showing our plane as being on time; unlike the other two preceding it! Our plane’s departure time was 1135, with a boarding time of 1050, yet at 1000 I noticed on the gate screens that they were showing a departure time of 1420! Hoping this was a mistake I went to check the main screens; these showed the same time of 1420! With no staff around and no desk airside I ended up going back through passport control and then back through security, where my boarding card was stamped to show I’d already been in, to the only information desk at the airport. This of course wasn’t run by Ryanair and the girls behind the counter were just as much in the dark as us, or so they said. Ryanair had told them the plane would be delayed and that 1420 was the best estimate at that time, they didn’t really know how late it would be and would make an announcement when they did. At 1107 I had a text from Ryanair confirming that our plane wouldn’t depart until 1420. At 1300 an announcement was made advising all passengers that were on our flight that if they presented their boarding cards at the food kiosk they’d be given free refreshments; these turned out to be a bottle of water and a sandwich, which the airline has to provide by law after a 2 hour delay. Thankfully the waiting seemed to fly by thanks to Francesca, a fellow passenger, who chewed the cud with us about anything and everything while we waited. She’d moved to the UK 4 years previous and had been flying Ciampino to Stansted regularly to see family in Italy and told us that this kind of delay had never occurred before during her travels. Maybe Ryanair just wanted to continue where TrenItalia had left us the previous evening; but just go one better in the delay stakes! Boarding didn’t commence until 1445 and even then we had to wait on a wedged bus at the gate until the plane was ready to take us. We eventually backed out at 1514, 21 minutes short of 4 hours late. The pilot seemed pleased to announce that the good news was we’d only take 2h10m to get to Stansted but lading 3h08m late wasn’t good news as far as anyone on board was concerned. We had advance tickets booked on the 1425 ex Stansted to Peterborough and the 1621 from Peterborough to Doncaster. The guard on the 1725 ex Stansted was more than happy for us to travel on his train and didn’t bother to check tickets anyway. At Peterborough we opted to flag the 1856 to Harrogate as it was full and standing and went across to platform 1 to board the empty 1923 to Skipton; which was starting at Peterborough vice Kings Cross, hence the emptiness. When I tried to explain to the guard on board about our lateness his reply regarding my reservations was “I haven’t even looked at it”. Having departed Rome almost an hour after we should have departed Stansted and then Stansted at the time we should have been walking through the door at home wasn’t the best and we were so glad to be home when we walked in at 2045! The bonus early finish completely destroyed by Ryanair, who then had the cheek to e-mail me to tell me that the delay was “Exceptional circumstances” which were out of their control; this then prevents any monetary claim against them by law. I’d already been onto Martin’s Moneysaving the moment I got reception and found that after 3 hours we were entitled to £210 compensation each, if it’s the airline’s fault. At no point had anyone actually told us why the delay had been caused and I was positive that Ryanair couldn’t have suffered from any exceptional circumstance as there were no bad weather reports for anywhere in London or Italy so I was going to get to grips with Ryanair and follow this matter through with them; even if I got nowhere, venting my frustration on them was going to be worth the rant! 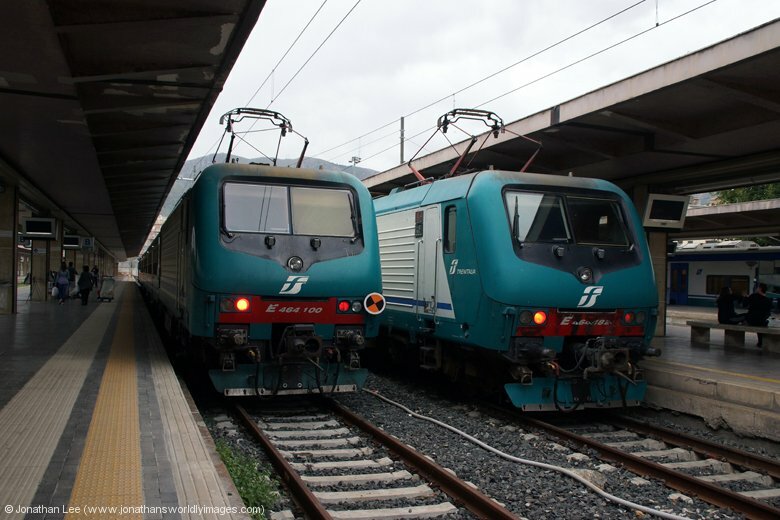 While we used Inter Rail tickets for travel in Italy it is cheaper to buy tickets either as you go, or in advance, on the Tren Italia website. Timekeeping leaves a lot to be desired though but there was nothing majorly late; it seemed that everything was a few minutes late as opposed to a few trains being a lot late! I will return to Italy, Rome is high up on the list of places to visit. In hindsight it seems like it was well avoided on this trip though, with what was going on at the Vatican!